Dedicated to recreating and enjoying activities from the past. 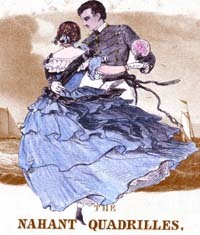 The New England Vintage Arts Society and Vintage Victorian present an unforgettable weekend of dancing and amusements! The Week has sold out in the past. If you are planning on attending the whole week or several a la carte events we recommend signing up now to save your spot. If you are planning on attending just one event there is a smaller “Single Event” deposit option. If you would like to support the Dance Week and keep it accessible to everyone, please consider giving to our scholarship fund. Your gift will be used to assist deserving attendees who cannot otherwise afford the weekend. We strive to keep the registration fees as low as possible so that everyone can attend; every little bit helps us open the world of the past to more people now, and in the future. Your gift will help us achieve that goal. Our home is in one of America’s oldest summer resort towns, with enchanting period venues amidst refreshing ocean breezes. Don’t miss this wonderful opportunity to experience a summer holiday as it might have been during the Victorian, Belle Epoque, Ragtime & Jazz ages. Full Registration is not open yet, as the last few details are still being finalized, but you can reserve your place today. We are taking pre-registration deposits now, and full registration will open shortly. Pack your trunks and warm up your ankles for a trip into history! Visit the Nahant Weekend home page for an overview of last year’s schedule.